Piraeus, the main Athens port. The distance between Piraeus and Mykonos is 85 nautical miles. Piraeus is close to the Athens center and can be reached both by bus and metro. Blue Star Paros, departing daily at 07:30 and arriving in Mykonos at 12:45. Frequent departures of “Nissos Mykonos” starting in June departing at 07:35 arriving in Mykonos at 12:00. On Tuesdays & Fridays also in the afternoon at 16:00 arriving at 21:10. Starting end of March with the Seajet 2 departing daily at 07:00 and arriving in Mykonos at 09:45 and then the Champion Jet 1 at the same times. Rafina, on the North Eastern coast of Attica. The distance between Rafina and Mykonos is 71 nautical miles. Rafina is further out from Athens, closer to the Athens International airport and can be reached by bus and taxi. Daily at 07:50 arriving in Mykonos at 12:00. Daily both in the morning and the afternoon on most days. How much does the ferry from Athens to Mykonos cost? 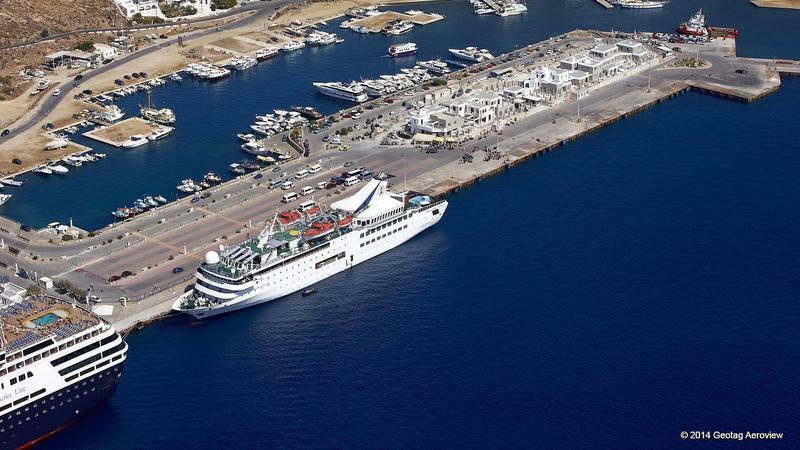 Ferry prices from Piraeus to Mykonos start at 35 euros per person in economy class aboard a conventional ferry and can go up to 59.70 euros per person in economy aboard a high speed catamaran or hydrofoil. Ferry prices from Rafina to Mykonos start at 29 euros per person in economy class aboard a conventional ferry and can go up to 56.90 euros per person in economy aboard a high speed catamaran or hydrofoil. How long does the ferry from Athens to Mykonos take? From Piraeus port, the fastest you can reach Mykonos by ferry is 2 hours 45 minutes on a catamaran or hydrofoil. If you choose a conventional ferry, the travel time is between 4 hours and 30 minutes and 5 hours and 30 minutes. It depends on the ferry and the route. From Rafina port, the fastest you can reach Mykonos by ferry is 2 hours 20 minutes on a catamaran or hydrofoil. If you choose a conventional ferry, the travel time is between 4 and 5 hours. It depends on the ferry and the route. 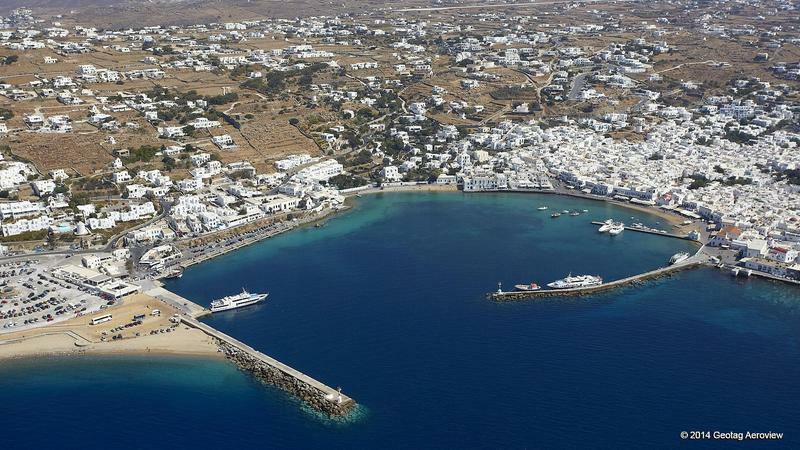 Mykonos has two ports, the old port next to the main village “Chora” and the new port which is a little further away. All car passenger ferries, both conventional and catamaran, dock at the new port. Only small hydrofoils like the SeaJet, Superjet and Flyingcat dock at the old port. Ferries departing from Piraeus port in Athens, stop in Syros and Tinos on their way to Mykonos. Ferries from Rafina port in Athens, stop in Andros and Tinos on their way to Mykonos. Most high speed hydrofoils and mono-hulls usually only stop in Tinos. Conventional ferries are slower but the trip is more comfortable and easy going. You can walk around, sit outside and enjoy the ride. On high speed hydrofoils, catamarans and mono hulls, passengers cannot go outside while traveling and are in general less sea worthy. Their interior is more like a plane with rows of numbered seats. During the summer, strong Northern winds are very common in the Aegean. This means that the ferry ride to Mykonos, at some areas, can be quite bumpy especially with small high speed ferries. With strong Northern winds passengers from Rafina will have a bumpy ride for the first hour, hour and 30 minutes or so and until they are hidden South of the Island of Andros. Then there is a short, around 20 minutes, ride crossing from Tinos to Mykonos. Passengers from Piraeus, will have a bumpy ride after they pass Cape Sounion and until Syros.